Problems listening to these files? See media help. Clinton Richard Dawkins DSc, FRS, FRSL (born Nairobi, 26 March 1941) is an English  biologist, evolutionist, and writer. He is an emeritus Fellow of New College, Oxford, and was the University of Oxford's Simonyi Professor for Public Understanding of Science from 1995 until 2008. 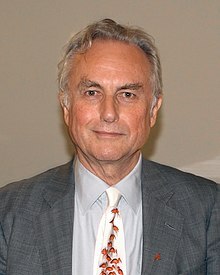 Dawkins is an atheist, a vice president of the British Humanist Association, and a supporter of the Brights movement. He is well known for his criticism of creationism and intelligent design. In his 2006 book The God Delusion, Dawkins contends that a supernatural creator almost certainly does not exist and that religious faith is a delusion—"a fixed false belief". :5 As of January 2010, the English-language version had sold more than two million copies and had been translated into 31 languages. Dawkins' ideas on evolution were heavily influenced by W.D. Hamilton. The influence can be seen throughout Dawkins' book The Selfish Gene. They became friends at Oxford and, after Hamilton's death, Dawkins wrote his obituary and organised a secular memorial service. He also writes for The Huffington Post. ↑ Taylor, James E. "The New Atheists". Internet Encyclopedia of Philosophy. ↑ "Richard Dawkins". London: Royal Society. Retrieved 23 April 2016. ↑ Dawkins, Richard (1986). The Blind Watchmaker. New York: W. W. Norton & Company. p. xvii. ISBN 978-0-393-31570-7. ↑ Dawkins, Richard (2013). An Appetite for Wonder. New York, New York: Harper Collins. pp. 271–283, 287–294. ISBN 978-0-06-231580-9. ↑ Grafen 2006, p. 67. ↑ Grafen 2006, p. 3. ↑ Grafen 2006, p. 14. ↑ Grafen 2006, p. 27. ↑ Grafen 2006, p. 50. ↑ Grafen 2006, p. 66. ↑ Grafen 2006, p. 101. ↑ Grafen 2006, p. 125. ↑ Grafen 2006, p. 130. ↑ 14.0 14.1 Grafen 2006, p. 191. ↑ Grafen 2006, p. 203. ↑ Grafen 2006, p. 213. ↑ Grafen 2006, p. 227. ↑ Grafen 2006, p. 236. ↑ Grafen 2006, p. 243. ↑ Grafen 2006, p. 248. ↑ Grafen 2006, p. 255. ↑ Grafen 2006, p. 265. ↑ Grafen 2006, p. 270. ↑ Although born in Kenya, Dawkins considers himself English. ↑ "Emeritus, Honorary and Wykeham Fellows - New College". www.new.ox.ac.uk. ↑ "Previous holders of The Simonyi Professorship". The University of Oxford. Retrieved 23 September 2010. ↑ "Richard Dawkins on militant atheism". TED Conferences, LLC. Retrieved 14 December 2011. ↑ Dawkins, Richard (2006). The God Delusion. Transworld Publishers. ISBN 0-593-05548-9. ↑ "The God Delusion – back on the Times extended list at #24". Richard Dawkins at RichardDawkins.net. 27 January 2010. Retrieved 6 February 2010. "Richard Dawkins — Science and the New Atheism". Richard Dawkins at Point of Inquiry. 8 December 2007. Retrieved 14 March 2008. ↑ "Richard Dawkins - HuffPost". www.huffingtonpost.com. This page was last changed on 11 February 2019, at 20:22.